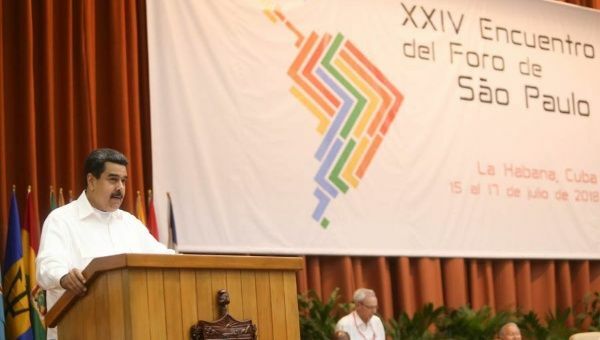 July 17 (teleSUR) “Latin America is undergoing a permanent process of renewal and transformation,” Venezuela’s President Nicolas Maduro told the closing ceremony of the XXIV Forum of Sao Paulo on Tuesday. The forum, held in the Cuban capital of Havana, focused on ways to strengthen unity and integration across Latin America and the Caribbean. The Venezuelan president vowed to continue in his fight against the forces of imperialism, manifest in constant attacks by the U.S. administration of President Donald Trump. “In Venezuela, we believe in permanent combat. Venezuela wants peace with equality, justice, democracy: we are the sons of Chavez and Bolivar,” Maduro said. Venezuela has lodged a formal request to host the next edition of the annual Sao Paulo Forum, according to the vice-president of International Affairs of the United Socialist Party of Venezuela (PSUV), Adan Chavez. The Forum emerged in 1990 as the result of the Encounter of Left-wing Political Parties and Organizations of Latin America and the Caribbean promoted by late Cuban President Fidel Castro and former Brazilian President Luiz Inacio Lula da Silva.